48 emotion-charged illustrations for telling our stories, owning our shadows and finding ways forward. Shadows and Deeper Shadows is an emotionally charged set of 48 watercolour images. This resource acknowledges that pain and suffering (such as grief, depression, loss and violence) often need to be storied before pathways to resolution can be found. The cards invite viewers to reflect on their experiences—to identify and explore the meaning of shadows in their lives. The images in the cards offer sufficient ambiguity for people to create the endings to their stories that are true for them. Contained in the images are subtle suggestions for hope and light, but they are there only if the viewer chooses to see them as appropriate. The images for the cards were created by award-winning artist, Carolyn Marrone, who specialises in painting everyday situations with great compassion and sensitivity. For over a decade, the simplicity and depth of her images has made them intriguing and useful to many people. Originally published as a set of twelve cards, this fully revised and expanded edition features an additional 36 images. Exploring fears and sorrows: Can you pick one card that says something about what is making you anxious or fearful? Can you say where this anxiety or fear comes from? Is the fear always there or does it come and go? Exploring the shadows in our lives: Is there a card that ‘speaks’ to you in some way? What does this picture mean for you? Does this picture describe or suggest events from your past? Are these events clear or hazy? Are they painful to talk about? Reflecting on practice: Use the Shadows cards with a colleague to think more deeply about a question, incident or concern. Can you choose a card that resonates in some way for you? What made this card stand out? What thoughts and feelings do you have about it? What does this say about the assumptions and values that are important to you? How does this connect to how you see yourself as a worker? Creative writing: The Shadows images represent people, situations and moods, but what do you notice when you bring your other senses to the pictures? What are the sounds, the smells, the textures, that permeate the images? Choose a card and write a piece where you put yourself in the picture. Feel the breeze in your hair, smell the wet footpath, hear the screaming kids in the car! Shadows and Deeper Shadows has been carefully designed as a resource that human service workers can use to help others describe and deal with their pain and sorrow. It does not come with a rulebook. But it does need to be used with acute sensitively and regard for timing. The person using the cards should always be able to decide what they want to discuss and when is the appropriate moment. Shadows and Deeper Shadows (expanded edition) published 2005. Polypropylene box and 36-page booklet. 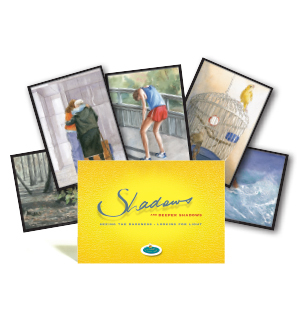 ‘When I purchased the Shadows cards at an American Counselling Association Convention, one of the salespeople asked if I would provide feedback about my experience with using this tool. I am a mental health counsellor at a small university, and several of my students/clients are art students. I have found the cards to be particularly helpful in working with students who are having difficulty disclosing or focusing on the issue that has brought them to counselling. The cards are used in a very interesting way to make me think about myself. They got me thinking that is for sure. 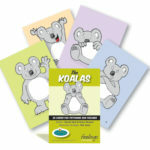 The cards were a very interesting tool to introduce feelings that people in the group can relate to that person. The cards are very good at evoking strong emotion. The artwork and details are very powerful. I have used the Shadows and Deeper Shadows cards in workshops. I regularly facilitate a workshop that focuses on the masks of grief. 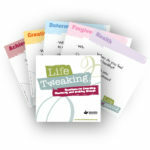 One module encourages the participant to choose a card that reflects some of the hidden feelings that they keep inside when in public to appear normal. The card that shows a brick building, for instance, has a small vase of bright flowers in the window. One woman said that the building reminded her of her emptiness and feelings of loneliness, yet the flowers showed that there was still a flicker of life deep in her being. Her mask reflected starkness of colour using veils over the mask (several layers) and a brightness under the veils to show that one day she would find a way to show that aspect of herself once more. Another card showing a mug and cracked glasses reminded a woman that she felt ‘shattered’; her mask showed cracks and fissures strongly imprinted all over the mask. Ten-year-old ‘Trent’ is one of many children who have benefited from Children Ahead after being referred by his school for aggression, abusive language and bullying. Exposed to domestic violence and his father’s substance abuse, Trent had been removed from his parents to live with his aunt and uncle. But violence and disruption had left their scars. Trent suffered from nightmares and often talked about his mother, asking why she never called. At school, he was struggling academically and also struggling with friendships, alienating other children with his bossy and demanding behaviour. Over a four month period, Sharon Teague, a caseworker with Children Ahead, formed a good relationship with Trent, making regular visits to his home and school, and providing the boy with time and space to address his experiences and feelings. Trent also selected the cards that showed images of a seagull and a boy lying in bed, which reflected his strong connection to nature and love of the outdoors. When asked to select a card that represented the future, he chose the card of a table laid for celebration and said it could be any time his family were all together. Excerpt from ‘The Masks of Grief,’ The Serious Optimist, no. 31, 2006. Bette Phillips is Family Support Services Coordinator for families and individuals bereaved by workplace fatalities. She also facilitates grief-related workshops, one of which focuses on the masks of grief. The card that shows a brick building for instance has a small vase of bright flowers in the window. One woman said that the building reminded her of her emptiness and feelings of loneliness, yet the flowers showed that there was still a flicker of life deep in her being. Her mask reflected starkness of colour using veils over the mask (several layers) and a brightness under the veils to show that one day she would find a way to show that aspect of herself once more. The making of the masks was done in silence so that each person could concentrate on their thoughts and feelings, and stay in touch with the level of energy they were experiencing. One mask was bright and shiny with a sad face underneath; another beautifully jewelled indicating the children still surviving with a beautiful centerpiece for the son who had died. Another showed a number of veils suggesting that no one could see the ‘real me’; and yet another was painted simply with a single tear. I visited home today for the second time. It was a bit of a relief to update the image of the property in my mind, getting rid of the bleak first image. The first visit back was three days after, when the fire department deemed the town safe again. That visit was nearly as bad as the actual day itself. It seemed like an alien landscape as we drove through town. Even the people we’ve known all our lives seemed like strangers, everyone’s head hung low while their colourless faces scanned for lost possessions. The house had been demolished: as soon as we came around the bend in the road we could see that. The only thing sticking out of the blackened ground was a big shadowy shape. We couldn’t figure out what it was until we got closer. Lucy was the first one to realize. It nearly made me laugh when she told me. It was Mum and Dad’s old Philico fridge. I’ve hated that stubborn old thing since we got given it. We didn’t give it away as we thought it would cark it in a couple of months, but it never seemed to. This really was a testament to how stubborn it was—not even 90 km/h winds and blistering heat could kill it. When we got out of the car everyone grew silent, tears welled in Jenny’s eyes instantly. There was just devastation everywhere you looked. I couldn’t even look over to the paddocks, as I didn’t want to admit to myself what the blackened mounds really were. The kids were okay, until they lost it when they went over to the dog kennels. It took hours to console our youngest. So today’s visit in comparison was much less eventful. The ground still clung to its new black cloak, but this time green littered the surface. There were new shoots growing off the scorched trees and new life growing out of the ground. When the light hit the leaves it was one of the most beautiful sights I have seen. It made me remember why I loved living in the bush so much. My feelings of disgrace, the guilt that I had made my family live in this environment which I knew could be deadly, slipped to the back of my mind for the first time in months.